BLUEBELL WALK FARM TRAIL: This is its 47th year and takes place at Bates Green Farm, Arlington daily from 10am to 5pm from 11 April to 19 May. See www.bluebellwalk.co.uk for all information. The Lions will be running the lovely tea room on the opening days 11 and 12 April, followed by the Rotary Club on 13 and 14, Park Mead School will be taking over on 15, Demelza on Tuesday and Wednesday, Children with Cancer Fund on Thursday and the JPK Project on Friday and Saturday. There are many local charities running the tea room until the 19 May. Visit the website for a full list of dates and charities at www.bluebellwalk.co.uk/charities for all the information you need about this glorious walk. The bluebells are already beginning to appear. FAMILY EASTER QUIZ: Hosted by Hailsham FM and Environment Hailsham, a sumptuous tea awaits quizzers at Summerheath Hall, Summerheath Road BN27 3DR. Teams of up to 8 are invited to book with Richard on 01323 842931 or at the Hailsham FM Studio. Tickets are £7, U12s £1 which includes the quiz, and beautifully presented tea and cakes. CHURCH SERVICES: All Saints: This Palm Sunday 8am Holy Communion (BCP), 6pm Palm Sunday Service of Praise. Friday 19, Good Friday, 2pm Service of the Cross, Sunday 21, Easter Day, 10am Easter Family Service and Holy Communion. EASTER EVENT: The local community are welcome to come along to Hailsham Cricket Club’s Easter event at the beautiful Roebuck Park Cricket Ground this Sunday. COUNCIL MEETINGS: Full Council and Parish Assembly on Thursday at 7pm at Upper Dicker Village Hall. The Parish Assembly is a meeting hosted every year by the parish council. It includes an Annual Report by the Chairman and reports from the County and District Councillors. It also includes reports from some of the clubs and organisations in the Parish. It will be followed by a Full Council Meeting after which refreshments will be served. You are cordially invited to attend. EASTER EVENT: The local community are welcome to come along to Hailsham Cricket Club’s Easter event at the beautiful Roebuck Park Cricket Ground. ANNUAL TOWN MEETING: The Town Council want to hear your views. This is your meeting at which your needs and concerns are addressed, so please do come along and make your comments and suggestions. Your town councillors will be there to listen and help. The meeting is on Wednesday at the Civic Community Hall, Vicarage Lane. There will be information stands from local organisations from 6.30pm and the main part of the meeting starts at 7.30pm and will be chaired by the Town Mayor, Cllr Nigel Coltman. If you would like to submit a question in advance, please write to: The Town Clerk, Inglenook, Market Street, BN27 2AE. The deadline for submission of questions is today, Friday 5th April. Residents can also turn up and ask questions on the night. CHURCH SERVICES: All Saints: This Sunday 10am Mothering Sunday Service, 6pm United Service with Free Church. St Mary Magdalene, Wartling: 8am Holy Communion (BCP). AUTHOR VISIT: Crime Writer, Robert Crouch, is the guest speaker at the Wealden Writers Group on Friday 5 April at The Gospel Mission Meeting Room in Station Road, Hailsham, from 2pm to 4pm. All are welcome to this free event. BEDES: Bede’s School has submitted a planning application to construct an additional hockey pitch with astroturf and high fencing next to the existing hockey pitch. This additional pitch will be very close to the Weald Way. The planning application also includes the relocation of a full size cricket pitch in the fields immediately next to the village. To do so, the school plans to fell two rows of 23 ancient Oak trees. These trees form boundary hedgerows dating from the Enclosure Act of 1855. The trees all have Tree Preservation Orders. Three species of bat including the uncommon noctule bat forage along these lines of trees and many birds have been recorded using the trees. The trees are part of our heritage and provide the local landscape character. 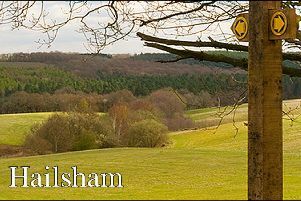 They are visible from the Weald Way, a national trail used by tourists. Oak Tree - Nature’s Greatest Survivor, presented by Dr George McGavin, BBC4, March 11, 9pm is well worth viewing on I-Player. Please e-mail or write to the Planning Officer, Wealden District Council by April 4, to express your views regarding this planning application, WD/2018/2556/MAJ. CHURCH SERVICES: Sunday, All Saints 8am Holy Communion (BCP), 11.15am All Saints Kidz Club, 3.30pm Compline. St Mary Magdalene Wartling, 10am Morning Prayer. U3A OPEN DAY: Apologies. I mistakenly put the wrong subscription renewal price last week. It is in fact, still incredibly good value at £14. Come along on Tuesday March 26 to the Civic Community Hall, by Freedom Leisure Centre and find out what you get for your fee. This is an open day for anyone interested in finding out more about U3A and the wide range of interest groups that it runs. It is also when existing members can come along and renew their subscriptions which are only £14 for the whole year. Refreshments will be served from 2pm with access to the hall and tables from 2.30pm. QUIZ NIGHT: Have you booked your table yet? This quiz is on Saturday March 30 at Hellingly Village Hall, 7pm for a 7.30pm start. Tables of six. Cheese platter, refreshments. Please bring own drinks. Cost £8 per head, tickets available from Barbara Moore 01323 841685. Raffle prizes. The fun raising committee would also welcome any donations of raffle prizes for their planned events. CHURCH SERVICES: Sunday, All Saints, 10am Holy Communion (CW). St Mary Magdalene Wartling, 8am Holy Communion (BCP). DICKER QUIZ: The ever-popular Dicker village quiz is at the village hall on Saturday April 6 at 7pm for 7.30pm. Tickets are £7.50 which includes supper (two courses) with tea or coffee. Bring your own other drinks. Whether you have a team of up to six, or come on your own, they will place you with a team or you can choose one to join. There will be a raffle with lots of prizes. The quiz master is Stuart Higgins. Tickets and information from Jenny 01323 844687 or Glynis 01323 846924. FARMERS MARKET: Hailsham Farmers Market takes place tomorrow, Saturday, at the Cattle Market Site, Market Street from 9am to 12.30pm. Please support your local farmers, producers and craftspeople at Hailsham Farmers’ Market. There will be regular produce of fresh meat, sausages, home-made meat pies and eggs from Renhurst Farm, as well as honey, seasonal fruit and vegetables from local farmers. As the planting season begins Wallace Plants will have a selection of plants particularly suitable for planting at this time of year. Jilly’s Cards has individually-designed greetings cards for every occasion, don’t forget Mothers Day on March 31. This market will run, whatever the weather. As always, there is plenty of free parking on site, pick your goods from the range at our stalls, and pack your shopping straight into your car, at Market Street. We are always looking for new stall holders. For traders information about taking a pitch please call 01892 852168 or email info@hailshamfarmersmarket.co.uk. COFFEE MORNINGS: The Coffee Morning and Book Exchange is at Dicker Hall 10.40am to noon Thursday Mornings. Book exchange or purchase 20p.